Friday January 22nd 1892 The boys killed one hog this forenoon and we got our ironing done. The girls came over in the afternoon and we visited with them. I was busy with my knitting. Saturday January 23rd 1892 We got the lard and work done up this forenoon and I went to town with Will in the afternoon. I ordered some groceries. I finished my knitting in the evening. Sunday January 24th 1892 It was a pleasant morning and Will and I went to church. The folks were all over in the afternoon for a visit. I read all the evening. Monday January 25th 1892 We got our washing out in good time and Will brought Mrs Pinney over before noon. I went to town a few moments in the afternoon to see Ott as Lee had been home in the night. He has decided to sell out the business in Burlington. I had quite a talk with Ott about what we are to do. I was down to see the girls but they were not at home. Tuesday January 26th 1892 We ironed this morning and got up a nice dinner. The girls were over from town. We had a splendid visit I began to make some lace for Hattie today for pillow cases. Wednesday January 27th 1892 I was busy with the house work all the forenoon. Mary Woolf was over for dinner and to visit with Mrs Pinney. We had a pleasant day. I worked on the lace. 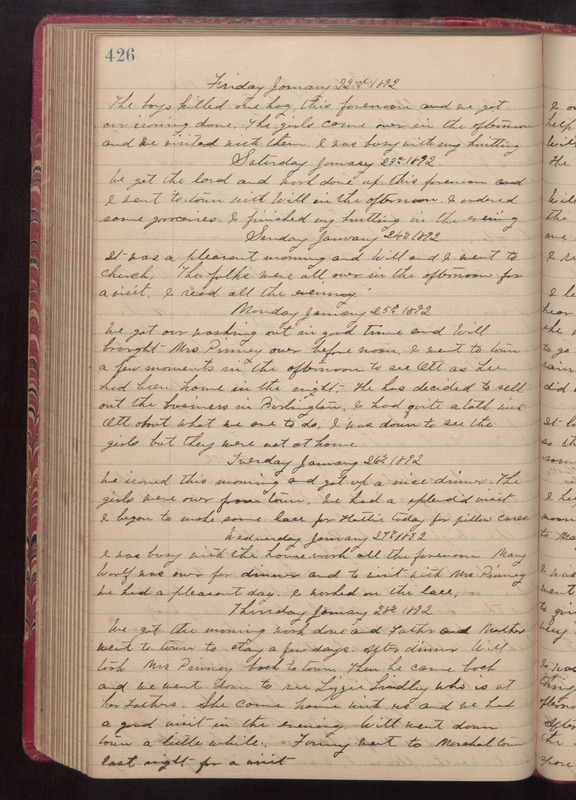 Thursday January 28th 1892 We got the morning work done and Father and Mother went to town to stay a few days. After dinner Will took Mrs Pinney back to town. Then he came back and we went down to see Lizzie Lindley who is at her fathers. She came home with us and we had a good visit in the evening. Will went down town a little while. Fanny went to Marshalltown last night for a visit.